The Church Militant (we are in a fight against evil here on earth) celebrates the Church Triumphant (the saints in heaven) on Nov. 1st and then prays for the Church Suffering (all souls in purgatory) on Nov 2nd. Our parish has a tradition of having a Solemn High Requiem Mass for All Souls Day with the music by Gabriel Faure. I lovelovelove the Litany of the Saints. Enjoy! For those of you who enjoy more modern music, there's Chris Tomlin. I have many books written by saints and about them. This one is fascinating: The Incorruptibles by Joan Carroll Cruz. The title itself would make anyone tired, no? My life revolves around home -- cooking, cleaning, writing, minding the kids, singing, praying -- so it's unusual for me to be so very busy as we were this weekend, but you'll see it was all good. 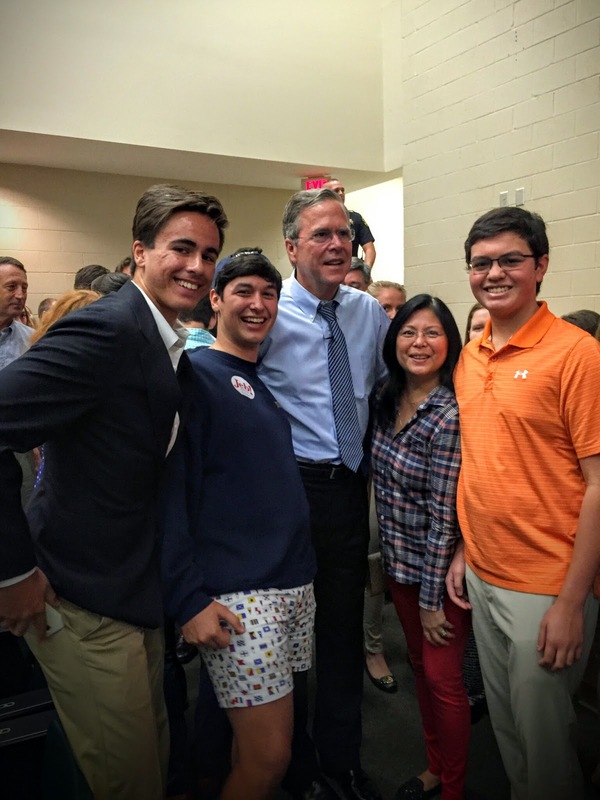 Saturday morning, Michael and the kids went to a town hall meeting with JEBush. I think Max looks like a young Republican already. They had a great time and were very much impressed with the things he had to say. I was sorry to miss it, but I wanted an hour of quiet before the Harvest Home Tour (a fundraiser for our public library). Here's a lovely write up in the local newspaper. I was so honored to be asked to participate and had a good time in a townhome that was comfortable and beautiful, designed for both privacy -- with little nooks for reading or writing -- and openness. Max was in his element, driving the patrons to the four different houses, and I'm sure hamming it up as well. Don't we clean up nicely? I had my books on display and especially enjoyed speaking with the teachers and librarians who were kind enough to tell me how much they love my older books on plant parts and graphing. Then it was off to Charlotte, NC to venerate the relics of St. Maria Goretti. Check out the tour schedule and if she's in your area, go visit. She is the youngest saint to be canonized and ever since her feast day (July 6th) this year, she's been on my mind. She is the little saint of mercy, of forgiveness, and of chastity because she refused the sexual advances of a young man, Alessandro. Enraged, he stabbed her 14 times. She endured surgery without anesthetic. 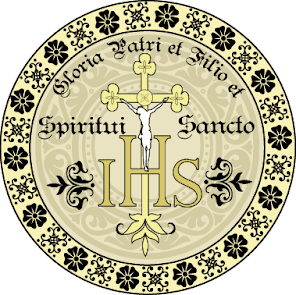 The following day, before receiving Holy Viaticum, with her eyes fixed on the Crucifix, she forgave Alessandro with these words, "Yes, for the love of Jesus I too pardon him, and I want him to be with me in heaven." 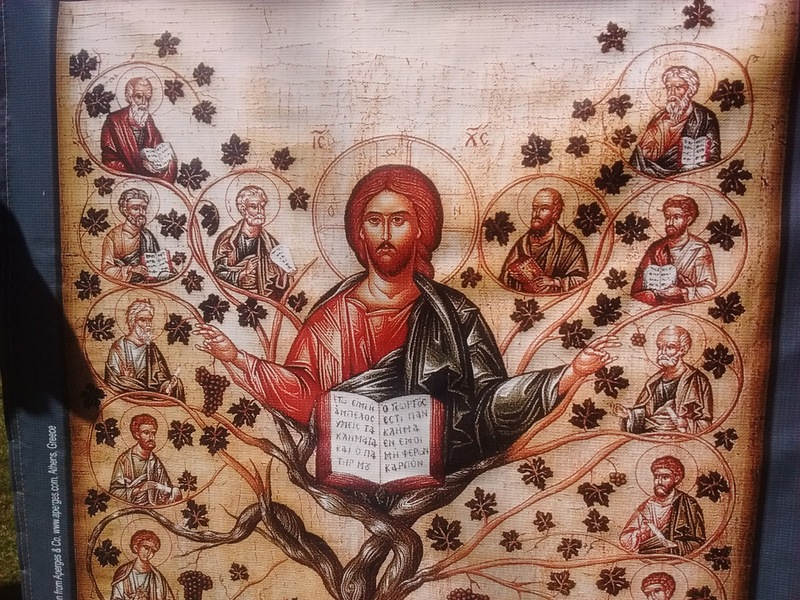 She died at the Vesper hour on the Feast of the Precious Blood while the Passionists, in a nearby church, were chanting Isaiah 63:1-2: Who is this that cometh from Edom, with dyed garments from Bosra, this beautiful one in his robe, walking in the greatness of his strength. I, that speak justice, and am a defender to save. Why then is thy apparel red, and thy garments like theirs that tread in the winepress? Alessandro didn't just take a life; he destroyed a family. You see, Maria's father had died the year before from malaria, and without Maria's help, her mother Assunta couldn't care for the younger children. They were all given away. Can you even imagine the grief of this mother? But she forgave him too. Alessandro had had a complete conversion in prison. But why this yearning to venerate the skeletal remains of St. Maria? I cannot quite explain it myself except that saints come into our lives when we need them most. As Dagny remarked, it's a strange custom but one that is part of Church Tradition. Years and years ago, probably when I was around 8 or 9, my mother had mentioned the little saint and how important it was to forgive. My mother didn't tell me Maria's story but still she remained in my heart. Little did I know what a big part she would play in my own life. You see, I too have an Alessandro in my life, and although I'd like to think I've forgiven and forgotten, it is still something I grapple with. I take the Lord's Prayer seriously and this sentence gives me pause: "forgive us our trespasses as we forgive those who trespass against us." Ouch. If I won't completely forgive the inexcusable, then what about all the inexcusable things I've done? Yes ... this forgiveness is a serious business. 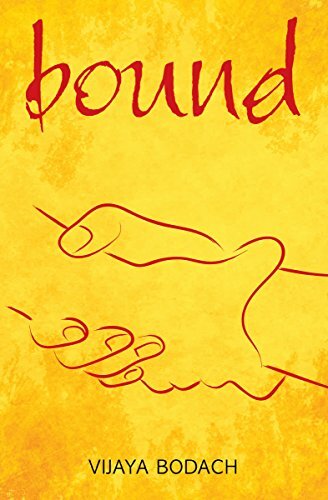 Our parish priest reminds us often, "You do not have to reconcile or be friends to forgive. It's an act of the will, so just do it." That is what I do on a daily basis and if I'm having a hard time, I ask God to remember that I have the *desire* to forgive even if I cannot do it well at times. 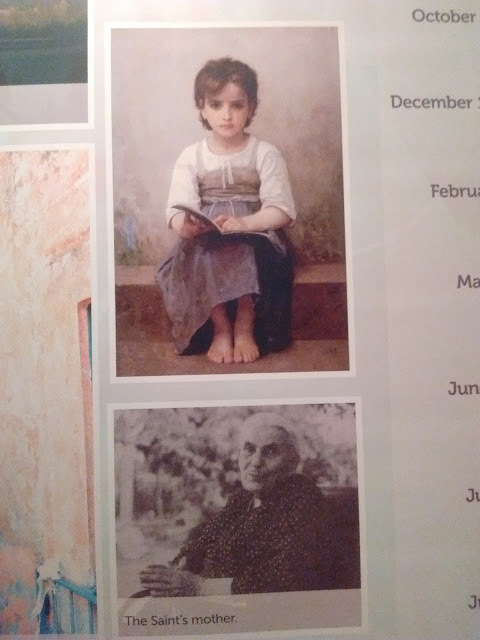 We should all be so heroic as little Maria. I didn't think we could make a pilgrimage because of the commitment we'd already made for the Harvest Tour so a dear friend's mother in CT went for me earlier (taking along our family photo), waited in line for two hours so that she could spend 15 seconds in front of the reliquary to ask for healing in our family. She didn't press for any explanations but simply did this out of the goodness of her heart. God bless her. Upon receipt of her letter, I wept. And it stoked the fire to go even more! 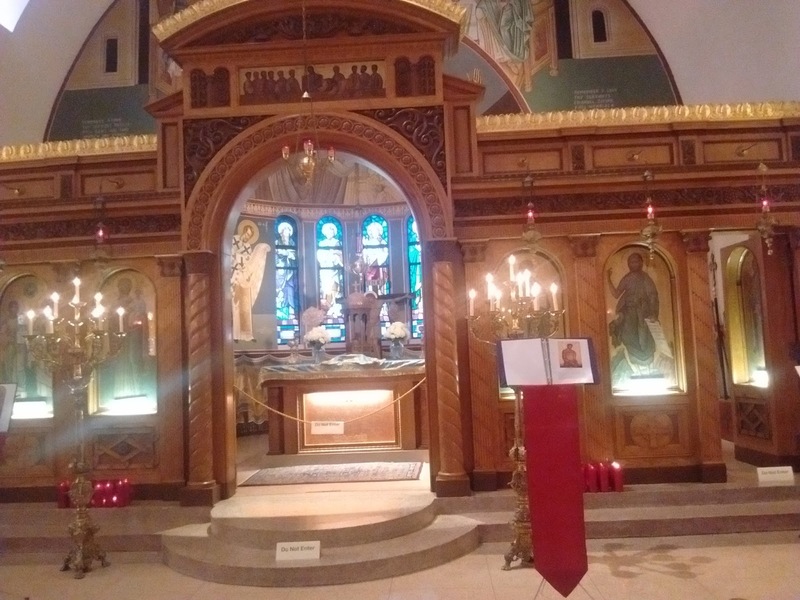 We checked the schedule one more time and as luck would have it, the Church hosting St. Maria's reliquary would be open all day and all night for veneration!!! Yes, we could do this. It didn't matter what time we arrived. Of course, what would normally take 3 hours took us 5 due to a couple of bad traffic jams, but we were not worried. It was a time to pray. The church would be open ... and it was beautiful. I cannot express the joy, the quiet hush of prayer. Even at 1 o'clock in the morning, the church was about half full of pilgrims. Priests, young couples, older people, families with many children sleeping on their parents' laps. Some were wide awake. Others were whimpering but there was so much peace. We were all drawn to this little saint. The line moved in an orderly fashion and there was no rushing or jostling -- it was a time to pray. I couldn't stop the tears from coming knowing St. Maria has been praying for me for so many years. I am thankful my family agreed to go on this trip at a crazy hour. I couldn't have made it alone ... not with Harry. So thanks be to God for everything. And thank you St. Maria for drawing us closer to you. We hope to meet in heaven. Please pray for us! Assunta said this portrait most resembled Maria. 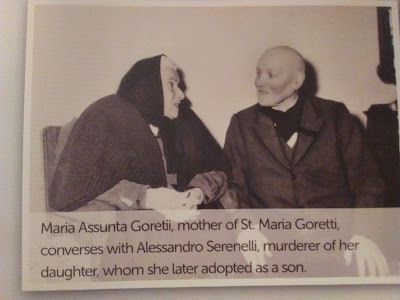 Assunta is the first mother to attend the canonization of a daughter! Maria was just a few months shy of 12 when she was killed in 1902. CS Lewis has a brilliant essay on forgiveness that is worth several readings. For a small gem of a book, see St. Maria Goretti: in Garments all Red, and there's a lovely Italian movie as well. 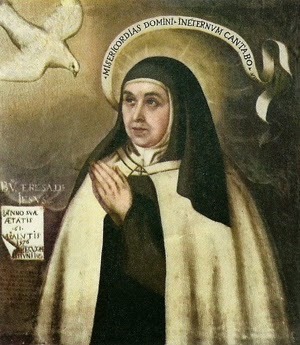 Teresa, after seeing this portrait said, "May God forgive you, Brother Juan, for having painted me ugly and bleary-eyed." You have to love her wit and sense of humor. I am surprised he didn't paint her with a pen or quill -- her writings on prayer and the interior life are so amazing, she was proclaimed the first woman Doctor of the Church. 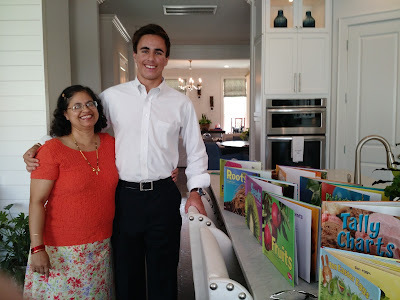 On her feast day (Oct. 15th) I delivered ten boxes of books for the Knights of Columbus book sale and for $20 brought home a box myself. That's progress, right? Among the books I bought was the first volume of St. Teresa's Collected Works. What a gift!!! I will be sharing some good books with you later, but first, a poem by St. Teresa. "For the Profession of Isabel De Los Angeles"
My wealth in losing all. In the cross my glory. My repose in His imitation. In His likeness my purity. This weekend we went to the Greek festival downtown Charleston and enjoyed the food, music and folk-dancing. But when I stepped inside the church, I thought I was in heaven ... they had stained glass windows everywhere, with the apostles and saints depicted, along with the mysteries of the rosary and then these beautiful old paintings. 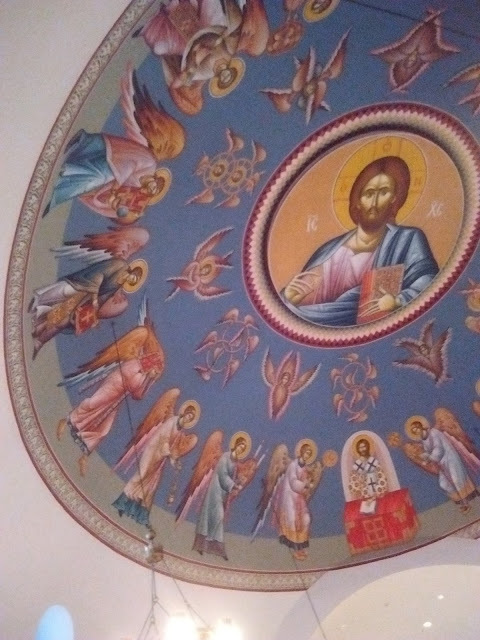 The one on the left is on the ceiling and the eyes of Jesus seem to follow you! God is good. My sister was married Oct. 10th, on the Feast of the Maternity of the Blessed Virgin (I know that sounds incongruous, but Christianity if full of paradoxes like these). 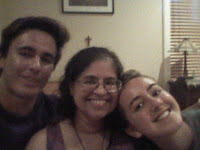 I had such a wonderful time visiting with all my family, esp. my nieces and nephews who are growing up so beautifully. So without further ado, I post some pictures of this beautiful sacrament, held in the replica of the first mission church (St. Williams) built in Round Rock, TX. Preparation involved hanging out and playing games. My sister made all the fancy bouquets and bows. Wedding day meant getting dressed up in all our Indian finery!!! My SIL (in the purple and pink sari) dressed and pinned me so that I could run around taking pictures. Here comes the bride but I couldn't get a good picture. I hope my nephew's wife got one. Oh, how wonderful it is to be a witness and remember our own wedding vows. Then it was off to the reception. Since I was in Round Rock for a week, it was a wonderful family reunion. We got to worship together and I also had a chance to visit Agape, a crisis pregnancy center, where my sister volunteers. I only wish all the Bodachs could've come but I know Greg and Suman will make a trip to see us when they get a chance. They are a mite busy right now ... planning their honeymoon in Italy!!! Mr. and Mrs. Greg Casey, wishing you both a long and happy life together. May you help each other get to heaven! God bless you now and always. You all might have known about the dreadful flooding in SC. We've been unscathed, just watching the levels rise in our yard with high tide since we're right next to the marsh and less than half mile away from the Cooper River. Schools reopened today, though many counties are still not in any shape. Please pray for all the victims. The kids and I have been monkeying around with my new phone and since I couldn't seem to make any headway with the novel revisions, decided to pull a couple of all-nighters. I've not done this since graduate school. Even when I had newborns, I got a little bit of rest in between all the feedings. So I am happy to report that I am done with this round of revisions on my YA contemporary novel. Of course, the moment I printed it out, I thought about some things I need to add/change/clarify but that will have to wait. I'm taking a week off to clear my head. Then I need to go with a fine-toothed comb and get ready to send it out again. Wish me luck! I'm really hoping I've hit the mark this time. If Max ever makes a time-lapse of the lunar eclipse, I will share it. Alas, he's been busy with school and football and robotics and enjoying it all thoroughly. What a sight to behold, the moon so close to us, and the earth's shadow darkening it. And the more the moon was shadowed, the greater its reddish hue. Although we had clouds flitting about, we had a wonderful time hanging out on our porch watching this celestial event. I still remember the time when our kids were little and we brought our sleeping bags outside so that we could watch the meteor shower. 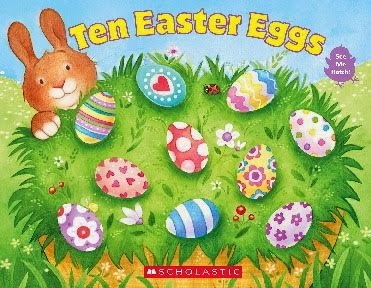 To see dozens of them one after the other, well, we don't even have that many wishes! I didn't make my goal of finishing up the revisions by the end of the month, but what a glorious month nonetheless. But we had birthdays, saints and angels to celebrate. I didn't realize how busy these past two weeks were with extra choir practice because although I thought I'd get back to my novel, I've been spending a lot of time relaxing on my back porch, soaking up the beauty and songs of the birds. With high tide and Joaquin pounding us with rain, the water level is right up to our grass. It's beautiful ... and I find myself humming the Kyrie and Agnus Dei (my two favorite movements) from St. Bruno's Mass. We had a soprano soloist to sing the Benedictus and truly, truly what glory she gives to God with her voice! Just heavenly. 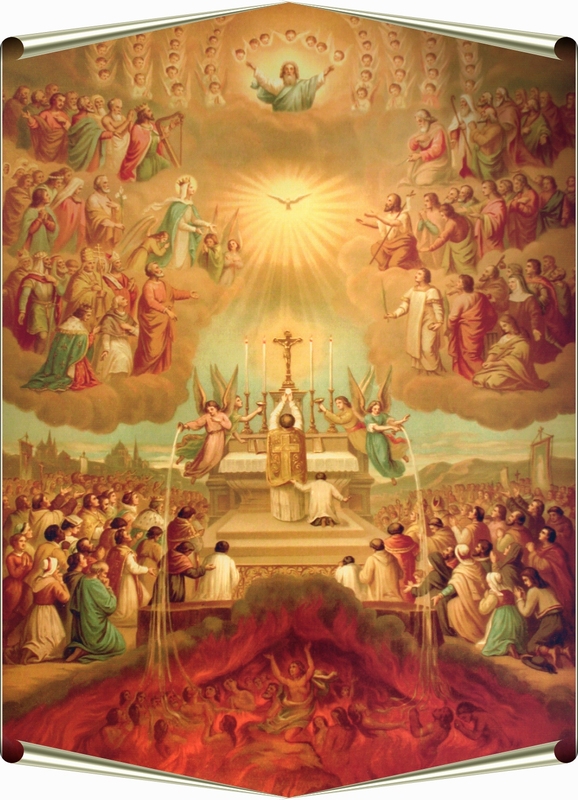 Mass gives us a taste of heaven here on earth. So briefly I will share what Fr. Folsom had to say. The homily was on the prayer to St. Michael the Archangel composed by Pope Leo XIII with the many Scriptural references (Daniel, Jude, Ephesians, Revelations). Fr. Folsom recounted how the angels were all created good, but by their own choice, some of them rejected God. "I will not serve." And so they cannot be in heaven. Hell is their dwelling place, a place completely devoid of God. I've always wondered why God did not destroy the bad angels given the horrors they have produced for mankind, but God permits them to live and allows them to test us. We too have to make a choice. Whom shall we serve, God or the devil? And even if we choose God, the Christian life is a constant struggle because of our fallen nature. We seek help from the good angels because we cannot do it ourselves. It's too dangerous. It's spiritual warfare, folks. After Mass, we had a wonderful potluck supper with the monks providing the beer. Michael said it gave him flashbacks of living in Belgium, where they make 300 varieties of beer. I never did develop a taste for it but from all the approving looks I could tell it was pleasing to all. I was most excited when I heard we'd get to bring the glasses home as a gift from the monks! Fr. Folsom spoke about the Benedict Option. Rod Dreher coined the term as a response to "pioneering forms of dropping out of a barbaric mainstream culture that has grown hostile to our fundamental values." However, there has been some confusion about what this really means. Does it mean to retreat from society? Yes and no. For a monk, yes. But not for the lay-people. In short, it is about following in the footsteps of St. Benedict and following his rule: ora et labora. It is a grassroots movement where Catholics endeavor to live in a community where Christian moral life can flourish in a post-Christian world. There is a fundamental tension of a Christian living in the world. We are to live in this world but not be of it. It is a nice saying but how do we achieve this? Ideally, it would be a Catholic society governed by the Gospel. In the middle ages we see the joining of Church and State and all the benefits it provided. Life, liturgy, schools, hospitals. That no longer exists anywhere. There are places where Catholics can reside peacefully. The Church is the heart of a town. But more and more, there are conflicts. There are laws banning manger scenes at Christmas. Or banning of crucifixes in Italian public schools. From hidden persecution, you can have overt persecution, such as in the Middle East, where you will be martyred for your faith. If martyrdom is a real possibility, many Catholics go underground. Right now, it is difficult to judge what will happen in our country but in both Europe and America, there has been a silent apostasy through absorption into the culture that no longer holds Christian values. Fr. Folsom said everywhere that a monastery has sprung up, it is a place where Catholic culture and tradition is preserved. People are attracted to the orderly life in stark contrast of a chaotic society. Families form small communities around the monastery to join them for Mass or other devotions. It's real, genuine and of God because it is Truth, Goodness and Beauty. Here's an interesting article that quibbles about the terminology but in reality is exactly what people are speaking about when they talk about the Benedict option: following in the footsteps of St. Benedict. We ended with a chanting of Salve Regina. I love our parish -- it's a little oasis where Catholic faith and traditions are flourishing -- where Christ is King!